A few days after the controversial victory of the “Yes” campaign for the Turkish referendum, the authoritarian methods of Erdogan’s government jumped back to the front page of Italian newspapers. 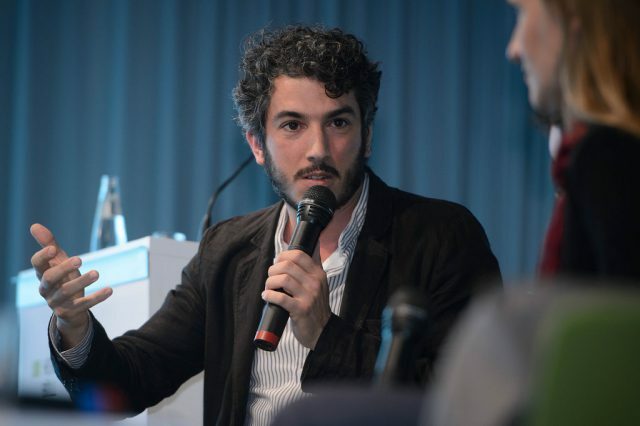 Gabriele Del Grande, journalist, film director and documentarian, has been held in custody for fourteen days without any charge and in violation of many human rights. Arrested on April 9th at the border with Syria, Gabriele is initially detained in an identification center of the Hatay province. From there, accused of interviewing the other inmates, he’s transferred to Mugla, where he’s deprived of his phone and held in solitary confinement. Only on April 18th, after nine days of imprisonment, is he allowed to call his partner, Alexandra D’Onofrio. In this call, she says, he sounds angry and worried, and he declares he is embarking on a hunger strike, which has now lasted for five days. On the same day, the Turkish authorities, in violation of the Vienna convention signed by the Turkish government in 1963, prevent Gabriele’s meeting with the Italian consul in Smirne and the lawyer Taner Kiliç, chairman of Amnesty International – Turkey and friend of his. The meeting is finally authorized for Friday April 21st, but the lawyer is still precluded from accessing the prisoner’s file, making it impossible to understand whether he has been charged with any crime. These were his ambitions when he reached Turkey. Right now the Turkish police, besides questioning him every day, is looking through all the material he collected, hoping to find some interviews with Kurdish people. This way they could charge him for propaganda and support of a terrorist organization, the Kurdistan Workers’ Party (PKK). In the upcoming hours we should be able to know something about Del Grande’s fate since the Turkish law stipulates a maximum of fourteen detention days before charges are brought or the prisoner is freed (in this case expelled from the country). Surely, recent examples are not encouraging for Gabriele’s family and comrades. Turkey is the country with the highest number of imprisoned journalists in the world. With 153 reporters in jail, they account for half of the incarcerated journalists of the world (most of them were arrested after the purge campaign following the failed coup on July 15th, 2016). Among others, the case of Deniz Yucel, Turkish and German citizen and Die Welt reporter, is particularly shocking. He has been detained in solitary confinement since February and, despite pressures from the German government, he may be sentenced to 10 and a half years of prison for propaganda in favour of the PKK and incitement to violence. Another striking example is that of the triple life sentence asked by the Istanbul attorney for sixteen employees of the publishing group Zaman. Among them are the known social commentator (perhaps the most famous in Turkey) Nazli Ilicak, the award-winning journalist Ahmet Altan and the Economics professor and analyst Mehmet Altan. Triple life sentences with no proof released to the public opinion, a further instance of the many authoritarian tendencies, should produce far stronger reactions from Brussels. For all the talk of defending freedom and human rights, the European Union has been more than happy to tolerate these abuses from Erdogan’s government and even fund him with multi-billion euro deals in exchange for the dirty work of keeping refugees out of Europe. At the end, in Turkey, nothing is left: almost two hundred (mostly Kurdish) websites, agencies, newspapers, television and radio channels shut down by the government and 153 reporters in jail. That is why an international civil mobilization and pressure is necessary for Gabriele and all the other journalists who have been held in custody for their attempts to exercise press freedom, independently of what one may think of their work and political positions.